Hi everyone! I'm here for the first time looking for an artist. At this moment I have some difficulties with 2D graphics for one small experimental game and looking for a free pixel-art artist who will help me. Now I use vector graphics drawn by my friend and I like it, but I think that pixel art is better suited to my requrements. Need full support. I have a some reference (covers about 60-70% of my needs) in vector graphics that needs to be totally reworked and rethought. I need about 100-200 sprites aligned to the grid (grid to be chosen, I think something from this list: 64x64, 96x96, 128x128, now I use 256x256 and that's too much for my purposes). Also keep in mind that I use simple procedural content generation, so I need more design elements from which the game-objects will be generated in the run-time. Soldiers can be assembled from a variety of parts. At the moment I have a reference in vector graphics for 13 sets of soldiers (3 sides, 3-5 types of sets). But maybe I'm overcomplicating and you can offer another solution easier, if it does not complicate or facilitate the layout of the unit from a limited set of parts. At the moment there is a reference in the vector for the 5 main types of weapons (submachine gun, assalut rifle, light machine gun, sniper/automatic rifle, general-purpose machine gun) and 2 auxiliary (hand grenade and rocket launcher). Conceptually, the player can control the soldiers squads indirectly. and the animation should be simplest in my opinion. Also mechs will be larger than soldiers (2x2 units). For mechs there is also a reference in vector graphics, but I do not like it very much and I almost did not work with it (at the moment it is not included in the project). Conceptually, the player can control a mechanized unit directly, like twin-stik shooter. Only a concept. Model of their behavior differs from soldiers and mechs - something like swarm intelligence and flock. There is an important moment. Now I'm use two models of artificial intelligence, which must adapts and evolves over time: human-like behiavor and animal-like. He is not particularly smart, but maybe it will be fun and it should be a proof-of-concept. 5. Environment and terrain tiles. There are my big problem. First, terrain tiles. Initially I used a system similary to the A2 autotiles. 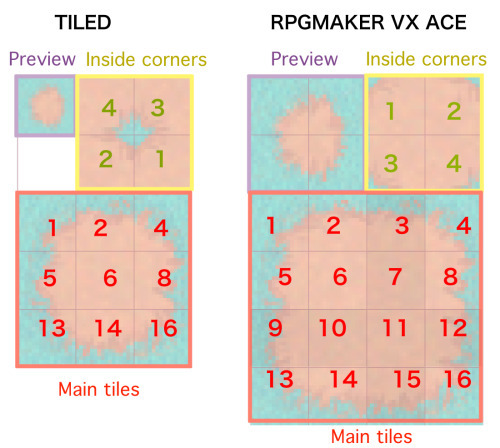 I have written my own implementation is same as in RPG maker: from picture consist of 4x6 subtiles I'm generate all 47 possible combinations then place the tiles on the tile grid. But now I'm leaning towards the idea of using approach like the Tiled and based on 2D extras for Unity3D (Rule Tile) immediately upon placing 4 tile, one cell of the map. According to my calculations I would rather subtiles 13 + some random: 4 outside corner, 4 inside corners, 4 sides and 1 internal subtle + variations of internal subtile. Second, decoration. This includes the sprites of trees, bushes, plants, rocks and other objects and based on 2D extras for Unity3D (Random Tile) . Some sprites are needed only to decorate the level, but the rest of the tiles should affect the parameters of the unit, for example, units can pass under the trees and get a bonus to protection. Thus, a number of sprites should clearly indicate to the player that they are a cover-up areas. Technically I can also account for different height levels, but don't use that at the moment (and not sure what I will use). Levels are generated automatically (I'm use combination of diffrence algorithms), but I can not yet achieve a satisfactory result for some reasons: there is a struggle between the technical complexity and the quality of generation, and there is some dependence on art, but I am interested in simplifying the generation process. 5. UI elemants and interface. I think this is the most simple of all of the above and this is still far away. 6. Concept-art, sketch, mockups. I think this is necessary in the first place, but not necessarily. Animation: most of the animation is done using by Mecanim in Unity3D. But some animations, like explosions and etcs are simple animation strips. Grid: now I'm use 256x256 px grid, but is very large for me. I think, that grid size will be like: 64x64, 96x96 or 128x128. Or strange Unity3D standart size 100x100 pixels per unit (the 96x96 grid seems to be the closest). The size of the grid exactly fits the terrain tile and large decorations (like trees). Small decorations and soldiers will be less than grid size (I think like 40-60% of grid size) and must fit inside the grid with any weapon in any poses. Mechs will be larger (like 2x2 soldiers). But it can be any visual realization, but the point of thing is looking "cool". I'm not an artist, so it’s hard for me to imagine a general concept of graphics, but I can adapt. Also, I don't need pixel perfect design (I'm using rotate nad transformation of sprites and some post-processing filters). I don't know how much I should pay for the work of the artist, so offer your price in private messages, but my budget is very limited, because I pay myself. The project is on the early stage of development, so work should be done bit by bit (by sprite packs). Now I'm trying to define the optimal art style, price and span of work for project. I hope I was able to outline in detail the range of tasks and what is required. I want to note that I am interested in getting less, but better. If something can be simplified, then it means that it is necessary to simplify it, if some thing turns out to be too complicated to implement, then abandon this thing.